The 2" nozzle on this GRP main cooling supply line had snapped off from the flange and was discharging sea water 5m vertically at a pressure of 3 bar. 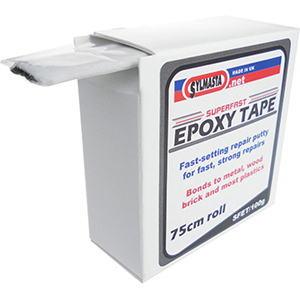 A teflon plug was secured into the hole and then Sylmasta Superfast Epoxy Putty Tape was used to seal the leak, followed by 7 layers of SylWrap Pipe Repair Bandage. It was also found during the repair that water was bubbling through the pipe surface around the nozzle, and this was sealed using further SylWrap. Do you have an application you would like to enquire about.